*Why do I keep mentioning magnesium & Epsom salt (magnesium sulfate)? Because many chronic physical and mental issues involve low intracellular levels of magnesium. Lab tests checking blood levels usually would miss the problem because the level in the blood is very low compared to the level in the cell fluid. Magnesium is needed to provide power within membranes to control flow of chemically active ions like calcium and sodium which are found in a larger amount in the blood and less inside of the cells. Too much calcium within cells can cause over-activity of the cell to the point of cell death. Magnesium supplements as a therapy can be helpful but the research is mixed, it may not be absorbed well by enough of the subjects in research studies to suggest that it isn’t helpful on average – people are individuals though, not group averages. Epsom salt, crystals of magnesium sulfate, is a well absorbed form when used dissolved in water, too much can be harmful as magnesium can slow the heart-rate if levels within the blood stream become elevated. Safe use of Epsom salt baths, foot-soaks, or even dampened compresses held on sore muscles can be inexpensive and effective. We need more health care that is inexpensive and effective. The planet needs healthy people and less medical waste. Treatment of illness can be costly in time and supplies for the patients and the healthcare team. Preventing worsening of chronic illness or symptoms mental illness improves quality of life for patients, saves time and money and supplies, and reduces the caseload of an overburdened healthcare system. Frequently there is a problem with accessing healthcare specialists or mental health care services, even if payment isn’t a problem. Epsom salt foot-soaks – might be simpler than a full bath. Previously I’ve shared an idea about a need for less expensive bathing facilities in urban areas, Public bathing facilities was an option in Rome. Apartments may have only a shower or there might be more tenants sharing space than is feasible to allow enough time for everyone to take turns in one or two bathrooms. The medicinal value of Epsom salt baths may also be difficult for those most in need to be able to enjoy as mobility might be limited. An easily transportable footsoak basin could be brought to a wheelchair or other seating arrangements. Residential facilities with many people who might benefit from the medicinal value of an Epsom salt bath or footsoak would have utility closets designed for easy use of wheeled mop buckets. A utility sink is equipped with a hose for filling buckets and a low rimmed drainage area is built into the floor for easy emptying and cleaning of the buckets. Some wheeled mop buckets have removable wringers to make the whole device easier to clean and may have different colors available to help identify which area the bucket is intended for use. (example color coded mop buckets) If the idea was found effective I imagine a company would be happy to make a product with a different logo on the side of the buckets and sell them without the wringer attachment. The wheeled buckets have handles on the side as well as the top to make emptying them easier. Simple solutions are most practical for busy workers. In a residential facility diabetic foot care is a regular need to help prevent small sores from going unnoticed by a patient with numbness/neuropathy and then becoming large sores. Gangrenous infections in small sores are a common cause of amputations being needed for diabetic patients. Magnesium and sulfate from the Epsom salt both have healing value for diabetic patients and people with other types of inflammatory illness. Swollen feet may be improved by regular use of topical magnesium treatments. Ease of use for workers is important as hauling buckets or basins of water around a facility is strenuous and potentially messy and dangerous. A wheeled bucket could be easily moved, used, emptied and sanitized between uses. After a footsoak it would be easy to inspect a patient’s feet for small sores, provide any toenail maintenance that is needed and possibly give a therapeutic massage. Knowing that Epsom salt baths can be extremely healing is knowledge – proving that it could be feasible to help many people in a budget friendly way is the next step. Patient care requires safety and effectiveness in order to provide a service ethically that will do no harm and which can still fit within a facility’s budget. A study that tracked groups of patients over time could look at direct symptom relief type of criteria and look at overall health statistics – were there fewer health concerns or falls or mood problems in the group receiving weekly, biweekly, or monthly Epsom salt foot-soaks in comparison to the control group who continued to receive standard care? Or a study design might compare the health parameters of the same group of patients over six months without the Epsom salt foot-soaks and then six months during which foot-soaks were provided. A review of what little scientific research is available regarding topical magnesium concludes that magnesium containing creams have not shown good absorption. Epsom salt soaks do lead to increases in plasma magnesium levels and urinary excretion of magnesium suggesting that the magnesium sulfate salt water solution does get absorbed through the skin, more likely through hair follicles (4) and sweat glands than the full surface of the skin. (1, 2) Absorption through mucous membranes is also likely, so a full bath would probably provide more absorption in less time than a foot and lower leg soak. More research is needed however and preferably with study subjects who have a chronic conditions that suggests they are magnesium deficient because excess magnesium is not needed and can be dangerous. People who are less deficient in the nutrient might not need as long of a soak time before achieving some symptom relief (may be helpful for muscle cramps, headache, anxiety, psoriasis). Staying overly long in an Epsom salt bath or foot soak could cause relaxing of smooth muscles which can cause watery diarrhea for the next day (like a stomach flu, all day problem), and more severe can cause slowing of the heart rate, bradycardia, — the point being that Epsom salt soaks are medicinal, not just for relaxing or a spa beauty treatment. When more deficient you might stay in longer before noticing more relaxing of muscles or change in heart rate and as weeks of regular soaks continue you may notice that a shorter soak is now adequate. Foot soaks would be less likely to cause excess absorption that can cause diarrhea/slower heart rate, while falling asleep in a bathtub with Epsom salt might. Ten to twenty minutes is a typical recommendation. A typical bath is about one cup of Epsom salt to a half bathtub of water, soak for twenty minutes, 1-3 times per week. I get muscle cramps and more anxiety when I take one per week instead of two and at a more severe level of colitis like symptoms I needed three per week, and marked it on a calendar so I wouldn’t forget. Substituting a foot-soak, I probably used a half cup of Epsom salt to a large bucket size plastic bin (rather than a short basin) and left my feet and lower legs in the water for about forty minutes, until the water was cool – I was working on a computer while soaking. Chronic illness is unpleasant, improved quality of life is more pleasant. *This will likely get some revisions/additional links. It is a continuation of the last post on TRP Channels & magnesium. Food and supplement sources of magnesium and the additional need for protein and phospholipids as carriers for intracellular supplies of magnesium is available in a previous post: To have optimal Magnesium needs Protein and Phospholipids too. Epsom Salt Council. [(accessed on 1 October 2015)]; Available online: http://www.epsomsaltcouncil.org/wp-content/uploads/2015/10/report_on_absorption_of_magnesium_sulfate.pdf. Chandrasekaran NC, Sanchez WY, Mohammed YH, et al., Permeation of topically applied Magnesium ions through human skin is facilitated by hair follicles., Magnes Res. 2016 Jun 1;29(2):35-42. To have optimal Magnesium needs Protein and Phospholipids too. Good news and bad news – magnesium in the form of Epsom salt, magnesium sulfate, has been in use medicinally since the seventeenth century and written about in peer reviewed medical journals since the early nineteenth century. (1) That is both the good and bad news – it is helpful, but it still isn’t used for many conditions where it might be needed. 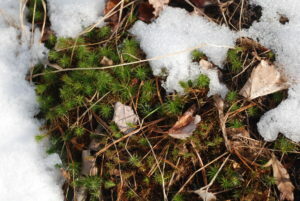 It is not patentable as a pharmaceutical medication because it is a natural substance. 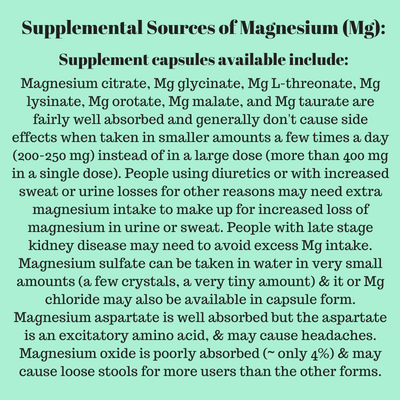 It or magnesium chloride and some other forms are in use for a few conditions including preeclampsia, migraines, stroke, and traumatic brain injury. Minor athletic injuries may be treated with Epsom salt soaks (3) and some psychiatric care providers may also recommend the treatment. Magnesium oxide is a form sometimes used in supplements that has been found to be very poorly absorbed even when the digestive system is in normal health. Only four percent of a dose is likely to be absorbed and the remaining 96% tends to cause loose stools by causing the intestinal muscles to relax too much if the supplement is in a larger dose. 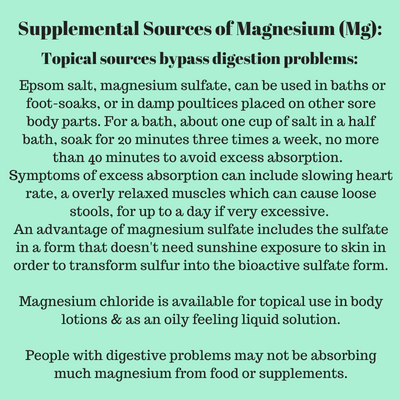 (1) Math – a 250 mg supplement of magnesium oxide might only have 10 milligrams absorbed and 240 milligrams pass through in the next bowel movement. 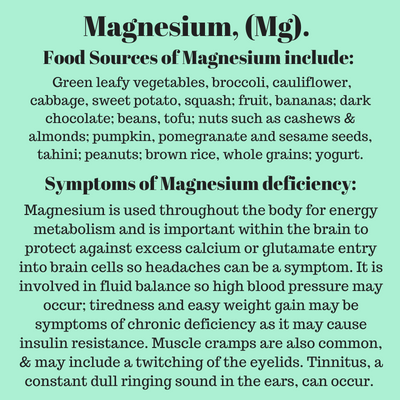 Magnesium Food Sources and Symptoms of Deficiency. Epsom salt, magnesium sulfate, can be used in baths or foot-soaks, or in damp poultices placed on other sore body parts. For a bath, about one cup of salt in a half bath, soak for 20 minutes three times a week, no more than 40 minutes to avoid excess absorption. An advantage of magnesium sulfate includes the sulfate in a form that doesn’t need sunshine exposure to skin in order for the body to be able to transform sulfur found in foods into the bioactive sulfate form. 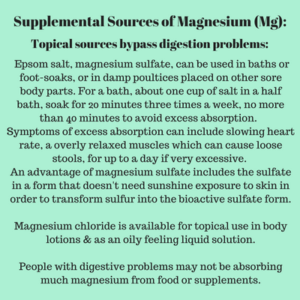 Magnesium chloride is available for topical use in body lotions & as an oily feeling liquid solution.People with digestive problems may not be absorbing much magnesium from food or supplements. 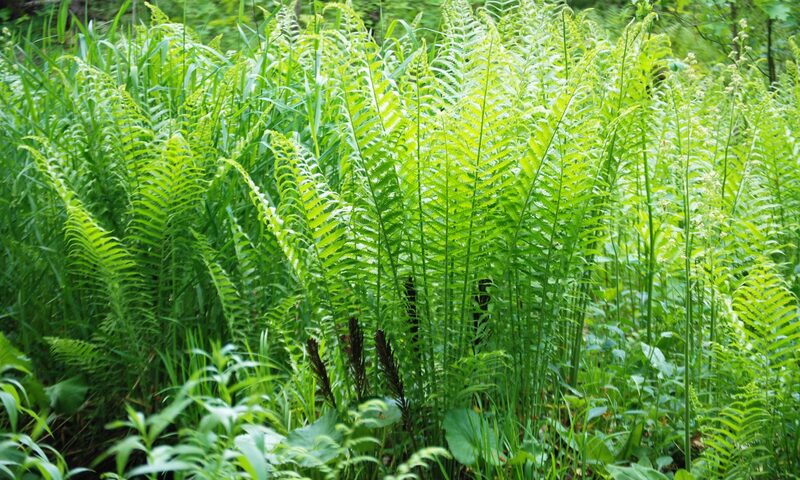 Topical sources of Magnesium and bioactive Sulfate. 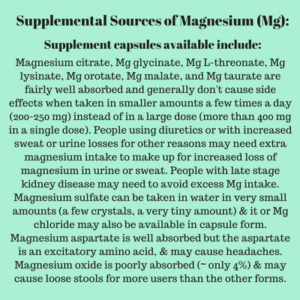 Magnesium sulfate can be taken in water in very small amounts (a few crystals, a very tiny amount) (3), & it or Mg chloride may also be available in capsule form. Magnesium aspartate is well absorbed but the aspartate is an excitatory amino acid and may cause headaches for some users. More information about protein and water needs are available in a post about kidney health: Make every day Kidney Appreciation Day.